I just read this good article about avoiding taboo behavior when traveling. I’m not talking about seriously bad behavior (getting in fights, committing crimes, going to jail). This is more about things you might do by accident that could offend people (like holding your fingers in a certain way that seems harmless but in fact is insulting people’s mothers). The article is pretty short on specifics, but in general it gives some good practical advice. The main point is that you should just know you’re in a different culture, and you should try to be aware of what feels right and wrong. Feel free to ask a local if you’re not sure about something, and do a little research before your trip. It’s nice to know in advance if there are any things to keep in mind for the countries you’ll be visiting. For instance, it’s frowned upon to blow your nose in public in Japan, China and France—who knew? As far as research, here's a nice detailed overview of the dos and don’ts of body language in various European countries (with links to other parts of the world). It’s written for businesspeople, but the tips seem pretty universal (don’t slap someone on the back in Belgium, definitely don’t give the “A-OK” sign in Spain). That all said, I’m of the mind that people are generally forgiving when it comes to visitors. As long as you give the (hopefully genuine) impression that you’re in their country to experience their culture and broaden your perspective on the world, I think they can let a little nose-blow slide. And yes, it does mean that toilets around Germany have a special smell this time of year. I have mixed feelings about this one, but mostly amusement. McDonald’s restaurants across France have just unveiled a new sandwich: the McBaguette. If you ask me, the sandwich itself looks a little on the terrible side. (This coming from a person who believes a simple baguette with cheese is the greatest snack in the world.) The McBaguette is a baguette with two burgers on it side by side, plus lettuce and some French mustard. Sort of like a horizontal double cheeseburger with a baguette instead of a bun. The McBaguette just went on sale on April 18 and will be around for six weeks. If it’s popular, it will probably return. Not surprisingly, it’s getting mixed reactions from the French. Some like the idea of injecting French culinary culture into the local McDonald’s menu. Others think the baguette itself is too soft. Others probably think the McBaguette is a sign of the apocalypse. Anyone traveling to France in the next six weeks? Though I'd hate to suggest using up a Paris meal at McDonald’s (there are too many other delicious traditional options available), I must admit that I am curious about the McBaguette. I’d like to hear how it is. A new bug-eating trend in the Netherlands? The cookbook (title translated as “The Insect Cookbook”) is full of recipes and ideas for cooking with bugs. For instance, sprinkle worms on your chocolate muffins. Or add grasshoppers to your mushroom risotto. There are all kinds of reasons to eat insects. You’ve probably heard them before. The main one is bugs are a good source of protein. The cookbook's creators also talk about the future—as population levels continue to grow and food sources become more scarce, insects could provide necessary nutrition. So we should start getting used to it now. The people behind the cookbook hope that insect dishes will start appearing more often at restaurants around the Netherlands and in Dutch people’s homes. Unfortunately, the cookbook itself is in Dutch, so unless you speak the language you may not be able to follow the recipes yourself. But if you’re going to Amsterdam, who knows, maybe you’ll see some insect dishes on the menu. I’m a big fan of Paris, having lived there for a few months many years ago. So I found this article pretty interesting. The main point is that Paris is evolving. It’s no longer just the city of world-class art museums, cheese, wine and the Eiffel Tower, though those things are thankfully still all there (I love cheese). Paris today has some surprises. One of these unexpected bright spots are the “shared gardens” that have sprung up all over the city, making Paris greener and greener. There are now more than 70 of these communal green spaces. They’re a nice place to walk, hang out, relax, or buy some locally grown produce. There’s also some off-the-beaten-path art to check out. I will say, if you’re only going to see a limited amount of art while in Paris, I do recommend the must-see museums like the Louvre and the Musée d’Orsay (they don’t disappoint). But if you have some extra time and are really into art, it may be worth checking out the galleries and studios in the Ménilmontant area, as the article describes. Other unexpected highlights include absinthe drinks, eating a meal in someone’s home, and hearing live jazz music under a bridge. All sound good to me. At the end of the day, once you’ve checked the must-see sights off your list, Paris has plenty of hidden gems to find. This could be interesting for anyone who’s going to Rome this summer. You will have the rare chance to look at 100 documents from centuries' worth of secret Vatican Archives. They’re going on display in a special exhibit at the Capitoline Museums. Normally only scholars who get special permission from the Vatican can look at this stuff. Now you can too. That's exciting. The collection includes a number of cool historical documents from throughout the long history of the Vatican. You can see things like the papal order that excommunicated Martin Luther and the document that condemned Galileo for heresy. They also have documents relating to the Knights Templar, as well as letters from Michelangelo, French author Voltaire and even Abraham Lincoln. All in all it sounds pretty cool, especially if you like history (or archives). Personally, I always get a little tingly feeling when I see actual relics from the ancient past, especially things with as much historical signifance as this stuff. The exhibit is called “Lux in Arcana: The Vatican Secret Archive Reveals Itself” and will be around until early September. A certain music-loving EF College Break staff member (Betsy) has compiled a list of big shows happening in Europe this summer. If anyone going on a trip is looking for something extra memorable to do, you might want to check into getting tickets. The big highlight looks to be the Wireless Festival in London's Hyde Park the weekend of July 6-8. Some single-day passes are still available. Check out the lineup on the festival website. Any coffee connoisseurs out there? Any going to Japan? When one thinks of hot drinks in Japan, one often thinks of tea first. But it turns out there’s actually a thriving coffee scene in Kyoto. Over the last decade or so, a number of owner-operated coffee shops have opened up in Kyoto, which is known as the cultural center of Japan. These coffee shops are serious about their coffee, and serious about the interior design and atmosphere within their shops. Many have nice views and elaborate decor. One of the owners says that to survive in the new Kyoto coffee scene, you need to show a lot of originality. And delicious coffee. For those more interested in tea, I came across this article about mastering the art of the traditional Japanese tea ceremony. In it, I learned that a good loud slurp at the end of your bowl of tea is key to showing the host you were happy with it. A good tea ceremony guest also holds the tea bowl correctly and takes time to examine it. All traditional tea ceremony etiquette stems from the Zen Buddhist concepts of harmony, tranquility, respect and purity. Sometimes tea—and coffee, for that matter—are much more than just a hot drink. Harry Potter fans who are traveling to London will probably be excited about this news. The Warner Bros. studio where they filmed large parts of the Harry Potter movies has just opened its doors for visitors. 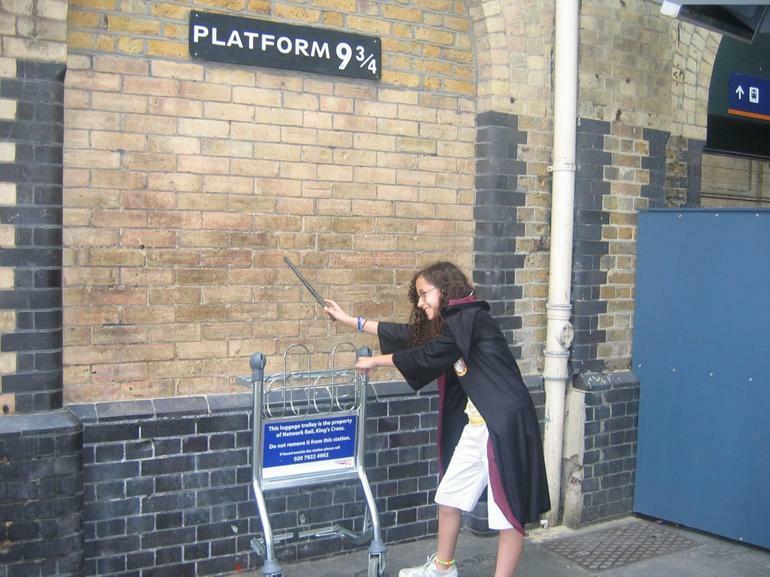 I’ve written in the past about Harry Potter sights in London (highlighted, I think, by Platform 9 ¾ at King’s Cross Station), but this will probably be even more exciting. Potter fanatics can now take a three-hour tour of the actual sets, props, animatronics and other movie magic that brought the Harry Potter films to life. I’m actually not a Harry Potter person. I haven’t read or seen any of it. So what I’m about to say makes no sense to me. The studio tour includes a walk through the Great Hall, where Hogwarts students ate and enjoyed the Yule Ball. You also get to see Gryffindor Common Room, Professor Dumbledore's office, the potions classroom, Hagrid's hut, the Weasleys' kitchen and the giant animatronic spider Aragog. Finally, visitors get to walk through a large room housing a huge scale model of Hogwarts Castle, which was used for various establishing shots and overhead angles. The tour costs about $45, and you have to book tickets in advance. It looks like it’s about a 20-minute train ride from London. For many EF College Break travelers on trips to London, I imagine this will be a great way to spend a free afternoon.